Welcome to R-Athletics! We are a premier gymnasium in Grand Rapids, Michigan that specializes in Recreational Gymnastics, Competitive Gymnastics, Ninja Zone, and RUSH. The mission of R-Athletics is to pursue excellence in everything we do, by creating an environment of learning that provides the ability for kids to be healthy, fulfilled, and successful individuals! Our goal is to maximize each child’s emotional, mental, and physical potential from beginner to elite through the sport of gymnastics and other athletics. Children will accomplish new skills while improving both physically and mentally. Invite your friends to celebrate your big day at R-Athletics! Enjoy a night out while your kids bounce, run, climb & tumble. Come Play for 2 Hours of Fun on Fridays! For Crawlers up to 5 Years old – We have designed fun classes for little athletes to learn coordination, flexibility, along with basic gymnastics skills. Parents are encouraged to take an active role in the younger classes. For Kid 6 to 18 Years Old – We offer age appropriate classes teaching basic to high-level gymnastics skills in a safe environment, using drills and lead-ups to every skill. Each skill will be taught according to the child’s physical and mental abilities, with safety as our highest priority. For Kids 5 to 18 Years Old – High School Gymnastics is becoming increasingly more competitive and R-Athletics wants to give your Middle and High School Gymnast the opportunity to train on state-of-the-art equipment during their off-season to develop their skills, strength and flexibility. For Kids 5 to 18 Years Old – Within age appropriate classes, your athlete will be coached & developed to compete with grace and athleticism in all four Olympic gymnastics events: Vault, Uneven Bars, Balance Beam, and Floor. The R-Athletics competitive gymnastics team will travel and compete nationally and internationally. The goal of R-Athletics is to pursue excellence in everything we do. R-Athletics works to strengthen and develop your children in a positive way while they gain confidence and have fun. 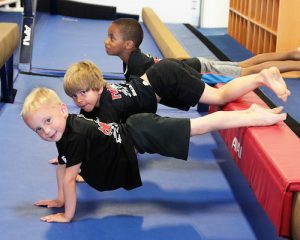 Our classes not only improve your child’s strength, flexibility, coordination, and confidence; they also prepare your child for his/her future in gymnastics or any other sport! Schedule a FREE Trial Class for your child! Your athlete will take part in an actual class, meet the coach and play with new friends while developing gymnastics skills! Your First Class Visit is FREE!